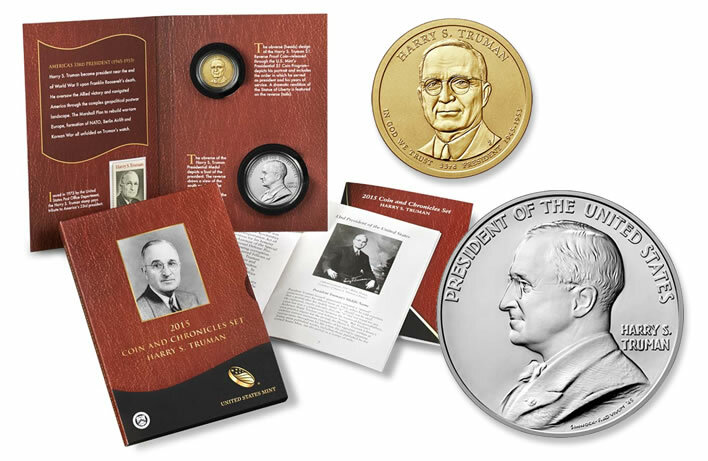 At midday on Tuesday 30 June, the US Mint launched the 2015 Harry S. Truman Coin & Chronicles Set. 15 minutes later it had sold out. The Mint explained that the issue limit of 17,000 had been based on sales of the previous two Coin & Chronicles sets – the 2013 Theodore Roosevelt Set sold 15,141 units and the 2014 Franklin D. Roosevelt Set had sold 13,255. However, the Truman set included a Reverse Proof Harry S. Truman Presidential $1 coin – the first of its kind for the Presidential $1 coin series. Reverse Proofs have been popular with collectors for some time now. For example, Reverse Proof Eagles continue to sell well every year they are minted. Already this year we saw the March of Dimes Special Silver Set, which included the first Reverse Proof Roosevelt dime produced by the United States Mint, sell out within a few days. But for a run of 17,000 coins to sell out inside 15 minutes is nothing short of remarkable and only serves to emphasise the power of online buying. Almost 20 of these coins were bought every second for 15 minutes – a feat that could only be achieved online. Delay your decision on whether or not to add a coin to your collection or portfolio and you could miss out on it forever. If you’re looking for an iconic American coin available in the UK in small numbers, I recommend you take a look at an original Morgan Dollar – a 90 year old plus coin straight from America’s Wild West. At just £49.99, it is a relatively modest purchase, but it’s a coin rich in history. You can read the story of the Morgan Dollar here.